Parmentier was the man who popularised potatoes in France in the 18th century. Whenever you see his name on a dish, it will contain potatoes," Roux says. 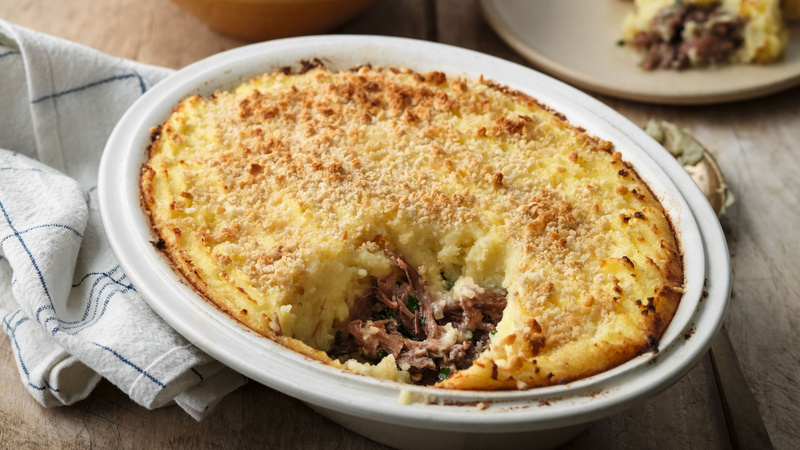 "This dish is a special version of cottage or shepherd's pie and very delicious." There's something about a warm, meaty filling covered in potatoes that's just perfect for autumn and winter. As for the duck, "In France, you can buy confit duck legs in most butchers' shops," Roux says, "but if you have trouble finding them in the UK, look for vacuum-packed or canned." Or, alternatively, you can buy duck legs and confit them yourself – you can find simple recipes online. Cut the potatoes into quarters. Put them in a pan of water with the garlic cloves and season with salt. Simmer until cooked, then drain, tip the potatoes and garlic back in the pan and leave them to steam and dry. Remove the garlic, pop the skins off and put the flesh in a small pan with the milk. Simmer for 5 minutes, and then blend together until smooth. Pass the potatoes through a ricer, mix in 30g of the butter and the garlicky milk, then season well. Set aside. Preheat the oven to 200°C. Remove the skin and bones from the duck legs and shred the meat from them. Warm a little of the fat from the confit in a frying pan and sweat the chopped onion until soft and lightly browned. Add the duck meat, parsley and the truffle, if using, and check the seasoning. Tip the mixture into a pie dish and press it down. Spread the mashed potato on top and run a fork over it to make a pattern. Sprinkle the breadcrumbs on top and bake the pie in the oven for 20 minutes. Place the pie under a preheated grill to brown the top.